Having a high-quality mattress is only part of the sleeping equation, and you still need to ensure the rest of your sleeping environment is correct to ensure that you get optimal sleep. 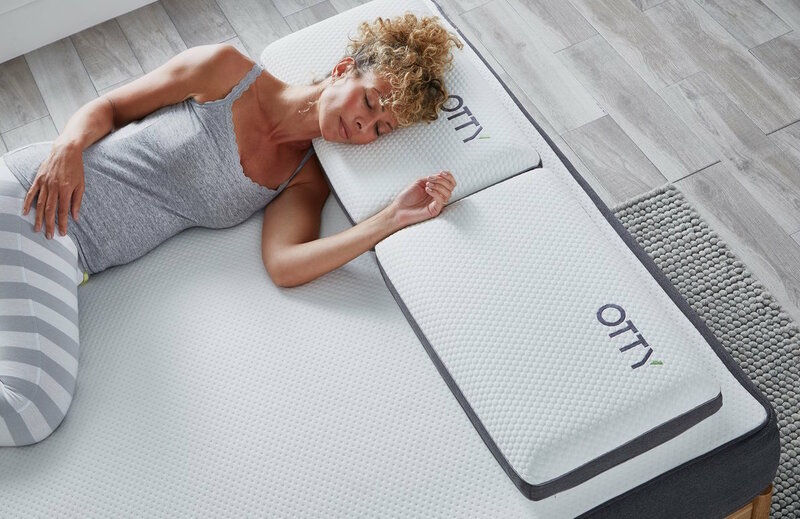 The pillow you use is incredibly important, and OTTY has created their deluxe pillow that can be purchased separately or in combination with their flagship mattress. We understand just how confusing it can be to know what pillow is good and who it will suit best. 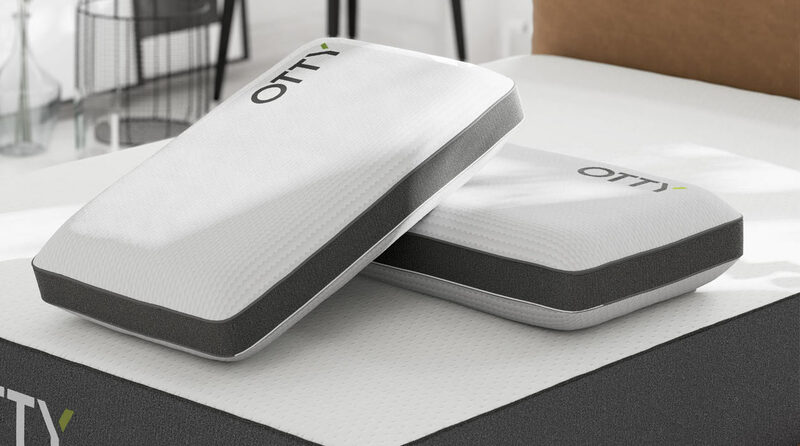 Which is why we’ve reviewed the OTTY pillow to show you the ins and outs of the product, so you can make a quicker decision without being slowed down by jargon. 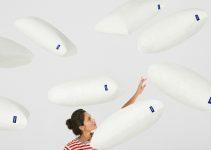 The OTTY pillow has been constructed using a combination of memory foam and cool blue gel. The memory foam contours to the shape of your sleeping position to ensure that you remain supported throughout and stops the feeling of neck pain in the morning which is due to using an unsupportive pillow. Memory foam reacts to pressure but then when the pressure from your bodyweight is removed it then reverts to its original shape which negates the need to plump the pillow because it's far less likely to lose shape in comparison to feather pillow alternatives. Memory foam has a reputation for sleeping hot and retaining heat which makes users overheat and feel uncomfortable. To stop this from happening, OTTY has included a layer of Cool Blue Gel which has thermostatic cushioning which is unique to OTTY and responds to changes in your body temperature throughout the night. It means if your temperature begins to rise then surplus heat will be dispersed through the airflow vents which are invisible to naked eye, so you will wake up feeling cool in the morning. This will improve the overall quality of your sleep, so you’ll wake up in the morning feeling fresher. The pillow is also hypoallergenic which gives you a greater fresher sleeping environment especially if you already suffer from skin allergies or dust. The pillow has a fully removable cover that removes and is machine washed at 40 degrees for added convenience. The pillow is aesthetically pleasing and different to most options available on the market and has a clear premium finish with thick grey trim. Even if you don’t have an OTTY mattress, this will still look great in your bedroom. OTTY have decided to design a pillow that’s suitable for main three sleeping positions being front, back and side. The pillow is 10cm in depth which allows this to be possible by providing enough loft to keep the spine aligned but high enough not to cause neck strain. If you’ve never used a memory foam pillow, then you’ll feel the difference in just a few nights due to the contouring nature of the material which can’t be replicated by other common filings such as Feather or Down. They have gone for a medium firmness feel which is not too soft or too hard. In terms of effectiveness and comfort by position, the pillow is more effective for back sleepers as your neck will be well supported, and the memory foam will mould well to the shape of your head. The next best position is for side sleepers where it correctly aligns the spine despite having less surface area in contact with the mattress and pillow. If you’re a front sleeper, then you may find that this still improves your sleep but not to the same degree as a back or side sleeper, however sleeping on your front isn’t healthy, to begin with. The OTTY pillow is ideal for people who either sleep in any position or sleep in a combination of positions throughout the night. The pillow gives off little noise due to the memory foam as it isolates motion effectively so not only will it not disturb you, but if you share a mattress with a partner or another person, you’re less likely to disturb them if you’re a frequent mover. It’s also ideal if you’ve historically suffered from neck pain as this will correctly relieve pressure and tension from the neck/spine area. The pillow comes supplied with a three-year warranty so you can buy in confidence knowing that the manufacturer will be there for support for several years and if there are any issues, they will replace the pillow with a new one.